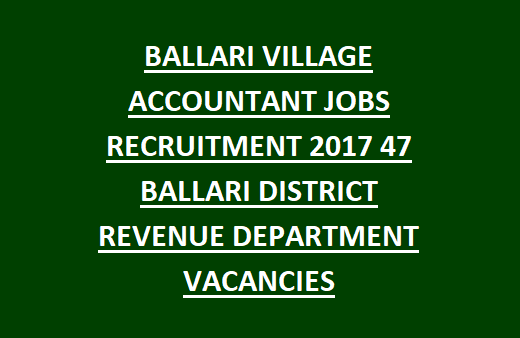 apply online for Ballari Govt Jobs official website http://www.Ballari-va.kar.nic.in apply for Ballari Village Accountant Jobs interested candidates should apply online apply online for Ballari Govt Jobs official website http://www.Ballari-va.kar.nic.in apply for Ballari Village Accountant Jobs interested candidates should apply online from 09-07-2018 to 16-08-2018. Ballari District village accountant Jobs recruitment 2018 selection process will be based on the performance in the written test and personal interview. For more information about the Ballari District village accountant Jobs recruitment vacancies, age limit and education qualification go through the information given below. Notification details for Ballari village Accountant Jobs recruitment 2018 Jobs Apply online. Ballari Village Accountant Recruitment Notification 2018 having 38 jobs are available detailed information will be given below. Ballari Village accountant Jobs vacancies are based on written test and Interview for more selection details go through the notification. Applying candidates needs to pay online using SBI collect Module or by SBI Module Generated Chalan. The last date for the fee payment 16-08-2018.